9/11 Crane Donated by Moye Handling Systems Inc. to the city of New York. Moye Handling Systems will provide expert services in crafting the best overhead hoist system for your needs. Our specialties include custom systems and we are happy to take a look at your overhead hoists in our own shop or yours. 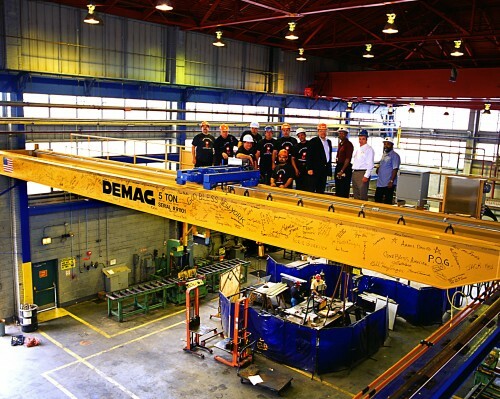 Moye Handling Systems was once called in by a customer with a one-hundred-year-old crane as their seventy-year-old mechanic had retired. Not only were there no manuals, but the overhead crane manufacturer went out of business years prior. Moye Handling Systems gladly took on the task of starting from scratch by reverse engineering the system. From state of the art VFCs or 1800s vintage DC systems, our company is sure to deliver any project on time and under-budget.